Figure 1. Assessment levels and measures (from JP 5-0, Page D-7, Figure D-1). Figure 2. 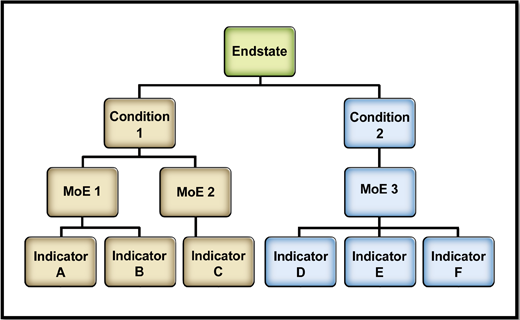 Example of the relationship between the endstate, conditions, MoE and indicators. Figure 3. Guidance on characteristics of MoEs compared across selected stability-related joint and Army doctrinal publications. Measures of effectiveness (MoEs), while commonly defined across Army doctrinal publications, are explained in different and sometimes confusing ways throughout several manuals. For leaders seeking to measure the effectiveness of stability operations at the tactical level, this adds confusion to an already complicated and difficult task. Given the central function of MoEs in evaluating mission success, and the difficulty of conducting successful stability operations, doctrinal guidance on this topic should be as clear, useful and straightforward as possible. This article will outline how MoEs are currently understood and used in Army doctrine, and will give recommendations on how doctrine can be adjusted to give more useful guidance on the use of MoEs to Army leaders, particularly those conducting stability operations in the contemporary operating environment (COE). While we can rarely be certain of an outcome, we make assumptions based on existing facts to establish causation between actions and results. These facts should include past inputs and their outcomes. During this process, we must be careful to distinguish between correlation and causation. Correlation means that two events tend to occur together with some frequency, but this does not necessarily imply causation. JP 5-0 states that assessment occurs at all levels and MoEs are created to support strategic and operational mission accomplishment.9 At the tactical level, missions, objectives and tasks are to be assessed, while effects are measured above the tactical level. This way of thinking supposes that commanders’ actions at the tactical level cannot be gauged within their areas of operation (AOs). However, effects at the tactical level should also be assessed to fully integrate tactical-level actions with the broader operational picture. The effects of tactical tasks are often physical in nature, but as JP 5-0 states, can also reflect the impact on specific functions and systems.10 Tactical objectives are usually associated with a specific target; however, according to doctrine, this action will result in some effect. The tactical level of war does not exist in a vacuum, and tactical operations create effects that have to be understood at the tactical level to help higher-level commanders better understand conditions in their AOs. This gap in current doctrine is depicted in Figure 1. MoEs are used to assess objectives and effects at the strategic and operational level, yet are only used to assess tactical objectives. While each level of war and command have endstates, their endstates are in reality objectives to meet the strategic endstate, as shown with the national and theater level guidance in Figure 1. To work toward the endstate, the lowest levels of war must ensure their objectives are working toward the endstate. JP 5-0 states that “[c]ommanders who are skilled in the use of operational art provide the vision that links tactical actions to strategic objectives.”11 To ensure objectives are met is to assess effects, which can only be accomplished with MoEs; otherwise, we run the risk of only assessing input. JP 3-0 states, “The operational environment is a composite of the conditions, circumstances and influences that affect the employment of capabilities and bear on the decisions of the commander.”12 Also, the operational environment is influenced by military actions that cause effects. As such, large-scale operations down to the smallest battle will result in some effect, likely indirect, that either works for or against the desired endstate. Likewise, a “good” commander’s intent is based on effects.13 The outcomes of tactical actions must be tied to strategy via the operational level of war, and this can be facilitated by including MoEs in tactical-level planning and analysis. Building on concepts described in joint doctrine, Army doctrine also requires commanders to envision an endstate to their operations that consist of a set of future conditions describing successful completion of their mission. It further requires that continuous assessments be conducted to determine progress toward achieving this goal. As part of this continuous assessment, commanders and their staffs use MoEs to evaluate progress toward attaining the desired conditions and to aid them in determining why the current degree of progress exists. This is the case in all types of military operations. However, during stability operations, using MoEs properly can be extremely challenging for leaders at the tactical level. At their most basic level, MoEs should be developed to measure those items of information within the operational environment that give signs of progress toward creating the conditions described in the commander’s endstate. MoEs are evaluated using subordinate measurement tools called indicators, which are items of information related to the MoE. Each of the conditions may be measured by one or more MoEs, while each MoE may be informed by one or more indicators (Figure 2). While simple to understand in theory, creating and choosing appropriate MoEs and their supporting indicators can be an extremely complicated task in practice. We need to know not only what to assess, but also how to actually assess it.14 This is no small undertaking, and deciding what to measure can determine whether there is actual progress toward the endstate. This makes the endstate that much more important. To fully reach any goal, the tactical level must be fully nested, which will require using MoEs to understand effects at the lowest levels because desired effects are nothing more than desired results from actions taken to achieve objectives.15 Unfortunately, doctrinal guidance on the subject is confusing and inconsistent, making it more difficult for tactical leaders attempting to make sense of it. For example, both FM 3-24 and FM 3-24.2 list the same four characteristics MoEs should have.17 However, many of these concepts are already addressed in the guidance listed in other manuals, albeit with different or less concise terminology (Figure 3). Only listing these four characteristics gives the impression they are the sole considerations that should be taken into account, and using differing terminology among doctrinal references can foster more confusion. Selecting and writing appropriate indicators to inform the evaluation of MoEs is another task that is simple in theory but difficult in practice, especially in complex operational environments. Joint and Army doctrine define and use indicators in different ways, and Army doctrine’s guidance is fragmented throughout several manuals. Understanding doctrine’s approach to developing indicators is critical to the success of assessment efforts. This guidance is valuable, if a little scattered, forcing leaders to comb through multiple doctrinal sources to effectively use it. While this paradigm may not be appropriate in every situation, this may help clarify the process for some leaders and make it easier to explain the logic of their assessment plan to commanders and their Soldiers. Evaluating progress toward the desired endstate during stability operations can be a challenging and complicated undertaking. MoEs and their supporting indicators play a critical role in this process, making clear, useful and straightforward doctrinal guidance on the subject extremely important. Leaders need to have a clear understanding of this process to succeed in the COE. Investing more time and energy in making doctrine’s approach to the subject more coherent could potentially pay enormous long-term dividends. 1The Air and Space Power Course, “Effects-Based Operations,” U.S. Air Force. 2Ruby, Tomislav Z., “Effects-Based Operations: More Important Than Ever,” Parameters, Autumn 2008. 3Morrissey, Michael T. MAJ, “Endstate: Relevant in Stability Operations?” master’s thesis, U.S. Army Command and General Staff College, Fort Leavenworth, KS, 2002. 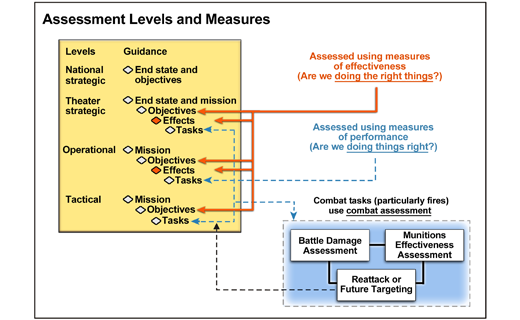 5McCormick, Shon MAJ, “A Primer on Developing Measures of Effectiveness,” Military Review, July-August 2010. 6DoD, JP 3-0, Joint Operations, Washington, DC: Joint Chiefs of Staff, Aug. 11, 2011. 7Gardner, David W. MAJ, “Clarifying Relationships between Objectives, Effects and Endstates with Illustrations and Lessons from the Vietnam War,” master’s thesis, Joint Forces Staff College, Norfolk, VA, 2007, abstract. 8DoD, JP 5-0, Joint Operation Planning, Washington, DC: Joint Chiefs of Staff, Aug. 11, 2011. 16Department of the Army, ATTP 5-0.1, Commander and Staff Officer Guide, Washington, DC: Army Publishing Directorate, September 2011. 17Department of the Army, FM 3-24.2, Tactics in Counterinsurgency, Washington, DC: Army Publishing Directorate, April 2009; Department of the Army, FM 3-24, Counterinsurgency, Washington, DC: Army Publishing Directorate, December 2006. 18Data for Figure 3 taken from JP 3-07, ATTP 5-0.1, ADRP 3-07, FM 3-24, ATP 3-57.20. 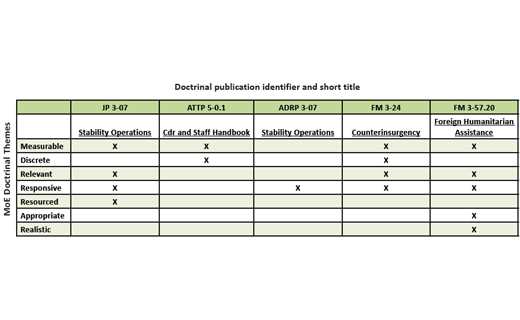 19Department of the Army, ADRP 5-0, The Operations Process, Washington, DC: Army Publishing Directorate, May 2012. 22Department of the Army, ADRP 3-07, Stability, Washington, DC: Army Publishing Directorate, August 2012.